It never ceases to amaze me that states and unions continue to put their money in hedge funds. Actually, it’s not even “their” money. It belongs to teachers, cops, firemen, and other people who get pensions after they retire. And this money is being mismanaged to a criminal degree. As of 2014, hedge funds had $450 billion in public pension money. $450 billion. That’s an incredible amount of cash. And so far this year, they’ve made 0.18% on that money, according to analyst firm Preqin. Not even a full percent. If you can’t even make 1% on your investments, you’ve got a lot of nerve calling yourself a professional. Now, I suppose it’s easy to see the lure of investing with hedge funds. A hedge fund is supposed to be uncorrelated to the stock market. That is, its strategies are supposed to make money regardless of what happens in the stock market. But that’s just a sales pitch. The reality is much different. Study after study shows that hedge fund performance is more correlated with stocks than they will admit. And even worse, their performance is not as good as the stock market. Yet despite the facts, state after state is allocating more money to these shysters. In 2005, Utah had 16% of its Utah Retirement Systems invested in hedge funds. In 2013, the number had grown to 40%. The result? $1.35 less in assets than if the Utah money had never gone to hedge funds in the first place. And this isn’t an isolated case. The consistent underperformance of hedge funds is well documented. Of the $32 billion New York invested with hedge funds, it made $40 million — over 10 years. That’s a full decade to make $40 million in an investment of $32 billion. Yeah, Treasuries beat that. So did CDs. Again, these are not isolated cases. On Friday, the New York Times reported on a study conducted by the Roosevelt Institute on behalf of the American Federation of Teachers. It studied a total of $43 billion of pension fund money invested in 11 hedge funds over a variety of four- to 13-year periods (the difference in time frames was intended to minimize the impact of outliers like the financial crisis). And what this study found is consistent with all the other studies: Over the time periods studied, pension funds had $8 billion in lost investment revenue. Pension funds should be $8 billion richer, and when you’re compounding over long periods of time, that $8 billion is significant. It’s easy to see why someone would want to start a hedge fund. It’s a ticket to easy wealth. Most hedge funds have what’s called a “2 and 20” structure. That means they take 2% off the top for management fees. That’s higher than pretty much any mutual fund. Plus, they take 20% of the profits they make. That adds up to some astronomical numbers. In the Roosevelt Institute study I mentioned above, the pension funds paid out $7.1 billion in fees to hedge fund managers. That works out to $0.57 on every dollar in profits to the fund managers. Basically, the fees were 57% of profits. In the New York City example, the pension fund paid $2.5 billion in fees to make $40 million. These fees are basically coming out of the pockets of teachers, cops, and firemen. On $450 billion, that’s $9 billion in fees that gets spent on Ferraris and mansions for the hedge fund managers. And if you really want to get pissed, just consider that these same hedge fund managers can leave their ill-gotten fee income invested in their own funds and then use the carried interest rules and pay around 20% in income tax! All told, it’s pretty ugly: Hedge fund managers take billions that should be going to cops, teachers, and firemen, enrich themselves instead, and then pay less in taxes than these same teachers, firemen, and cops. I tell ya, there’s some kickbacks or some kind of revolving door going on here. There’s just no way this should be legal. I wish I had a good reason as to why states keep putting money into hedge funds, but I don’t. You can blame the Fed for the steadily eroding standard of living of the American middle class if you want, but that’s not it. It’s basic corruption. That’s the problem today. Whether at the state or federal level, our politicians have become greedy money-grabbers. In the big picture, it’s undermining the whole idea of the American Dream. And it’s also lowering the standard of living of the average American, as some of our individual wealth is being consistently siphoned off to line the pockets of the political and financial elite. There are a couple really compelling factoids that go along with this table, like that the worst 20-year performance for the S&P 500 (NYSEARCA:SPY) was a gain of 54%. 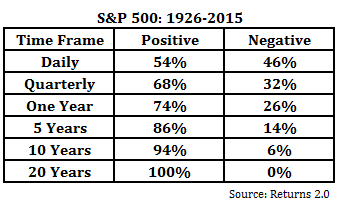 Even more incredible, the worst 30-year performance was an 854% gain. Stocks may be up or down on a particular day. But over time, the data gets overwhelming. This should be comforting, because it proves time is your greatest asset. Not fancy strategies, not incredible stock-picking skills. Just time. Buy an S&P 500 index fund of you want. Or focus on great brands and great companies. You see them every day — companies like Disney, Starbucks, Ford, or Apple. That’s what I do in my Wealth Advisory newsletter. We’ve got gains like 97% on Bank of America, 151% on Boeing, and 175% on Starbucks. Companies like these aren’t going away. As the U.S. population grows, so will their revenue, earnings, and dividends. And so will the money you have invested in them. It really can be that easy.